MySignals is a development platform for medical devices and eHealth applications. You can use MySignals to develop your eHealth web applications or even to add your own sensors to build new medical devices. MySignals allows you to measure more than 20 biometric parameters such as pulse, breath rate, oxygen in blood, electrocardiogram signals, blood pressure, muscle electromyography signals, glucose levels, galvanic skin response, lung capacity, snore waves, patient position, airflow and body scale parameters (weight, bone mass, body fat, muscle mass, body water, visceral fat, Basal Metabolic Rate and Body Mass Index). These broad sensing portfolio makes MySignals the most complete eHealth platform in the market. MySignals HW V2.0 is a development platform for medical devices and eHealth applications. You can use MySignals to develop your eHealth web applications or even to add your own sensors to build new medical devices. MySignals HW is a development platform for medical devices and eHealth applications. You can use MySignals to develop your eHealth web applications or even to add your own sensors to build new medical devices. Waspmote is an open source wireless sensor platform specially focused on the implementation of low consumption modes to allow the sensor nodes ("motes") to be completely autonomous and battery powered, offering a variable lifetime between 1 and 5 years depending on the duty cycle and the radio used. The e-Health Sensor Shield V2.0 allows Arduino and Raspberry Pi users to perform biometric and medical applications where body monitoring is needed by using 10 different sensors: pulse, oxygen in blood (SPO2), airflow (breathing), body temperature, electrocardiogram (ECG), glucometer, galvanic skin response (GSR - sweating), blood pressure (sphygmomanometer), patient position (accelerometer) and muscle/eletromyography sensor (EMG). Galileo comes with a single-core 32-bit, 400MHz Quark SoC X1000 processor, supports 3.3 or 5 volt shields and has an Ethernet and USB port. Compatible with Windows, Mac OS and Linux, the software of Galileo also has support for the Arduino shield ecosystem. Libelium's LoRa module works in both 868 and 900 MHz ISM bands, which makes it suitable for virtually any country. Those frequency bands are lower than the popular 2.4 GHz band, so path loss attenuation is better in LoRa. In addition, 868 and 900 MHz are bands with much fewer interference than the highly populated 2.4 GHz band. Besides, these low frequencies provide great penetration in possible materials (brick walls, trees, concrete), so these bands get less loss in the presence of obstacles than higher bands. 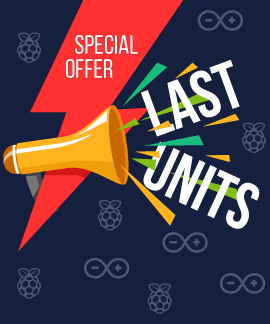 The Libelium LoRaWAN module has been integrated into the main sensor lines Waspmote and Plug & Sense!, however it has also been ported to Arduino and Raspberry Pi, so now you can create your own Low Power Wide Area Network (LPWAN) networks. LoRaWAN is a new, private and spread-spectrum modulation technique which allows sending data at extremely low data-rates to extremely long ranges. The low data-rate (down to few bytes per second) and LoRaWAN modulation lead to very low receiver sensitivity (down to -136 dBm), which combined to an output power of +14 dBm means extremely large link budgets: up to 150 dB, what means more than 22km (13.6 miles) in LOS links and up to 2km (1.2miles) in NLOS links in urban environment (going through buildings). Open Aquarium has been designed to help you to take care of your fish by automating the control and maintenance tasks that take place in the fish tanks and ponds. Open Aquarium consists of two different and complementary kits: Basic and Aquaponics, and many several extra accessories. The Open Garden platform consist of three different kits, each ready for a specific kind of growing plant scenario: indoor (houses and greenhouses), outdoor (gardens and fields) and hydroponics (plants in water installations). The platform allows to control the state of the plants by sensing several parameters. The new 4G shield for Arduino and Raspberry Pi enables the connectivity to high speed LTE, HSPA+, WCDMA cellular networks in order to make possible the creation of the next level of worldwide interactivity projects inside the new "Internet of Things" era. The new communication module is specially oriented to work with Internet servers implementing internally several application layer protocols which make easier to send the information to the cloud. We can make HTTP navigation, downloading and uploading content to a web server. We can also set secure connections using SSL Certificates and setting TCP/IP private sockets. In the same way FTP protocol is also available which is really useful when your application requires handling files. The 3G shield for Arduino and Raspberry Pi enables the connectivity to high speed WCDMA cellular networks in order to make possible the creation of the next level of worldwide interactivity projects inside the new ""Internet of Things"" era. The legend of Santa Claus tells that he lives in the cold, far, far north of the World. But does Santa Claus really live in the same North Pole? and if so, what is his exact position? The Cooking Hacks team decided to solve these questions! To do so we ask to the little Tamara for writing her letter to Santa Claus, and we sent it along with a geolocation tracking device we built. The tracking unit is composed by the 3G+GPS module for Arduino and Raspberry Pi equipped with a camera, a battery and a light sensor. The new shield designed for Arduino and Raspberry Pi integrates the SIM908 module which counts with both GPRS and GPS technologies what allows to easily perform realtime tracking applications. The idea is simple: read the GPS coordinates (longitude and latitude) and send them by using a HTTP request to a web server. Then use a browser to load the PHP webpage which uses Googlemaps to show the location in realtime. Avoid car thef is impossible but now find your stolen car will be easier! You just need to install your Arduino with the GPRS+GPS quadband Module (SIM908) in a hidden place in your car, maybe in your trunk, in the glove compartment or under your spare tyre. Then connect the GPRS-GSM and the GPS antenna and a SIM card, all of this powered with a battery and... you are ready! GPRS/GSM Quadband Module for Arduino (SIM900) offers GPRS connection to your Arduino board. It includes the SIM900 communication module from SIMCom. It is necessary an antenna in order to establish a communication. You can send SMS, make calls or create TCP and UDP sockets in order to send the information to the Internet. HTTP and FTP protocols are also available in order to send the information to the cloud directly from your Arduino. This is a project made for all mountain lovers. As you know, mountain sports are more than a walk. You need some experience and preparation to enjoy them safely. In this sense, it is strongly recommended to be located and monitored all the time. The aim of this project carried out by Cooking Hacks team is to develop a device capable to measure different biometric parameters, using some sensors compatible with our e-Health sensor board and send these data in real time to a receiver by means of a LoRa and 3G/GPRS wireless connection. This a standard defining the electrical characteristics of drivers and receivers for use in digital systems. It does not specify or recommend any communications protocol. In the next table the electrical characteristics of the standart are defined. The RS-232 standard was first introduced in 1962 by the Radio Sector of the EIA. The original DTEs (data terminal equipment) were electromechanical teletypewriters, and the original DCEs (data circuit-terminating equipment) were usually modems. For many years, an RS-232-compatible port was a standard feature for serial communications, such as modem connections, on many computers. The RS-232 standard is still used to connect industrial equipment (such as PLCs), console ports and special purpose equipment. CAN is a multi-master broadcast serial bus standard for connecting electronic control units (ECUs). Each node is able to send and receive messages, but not simultaneously. A message consists primarily of an ID (identifier), which represents the priority of the message. A CAN message that is transmitted with highest priority will succeed and the node transmitting the lower priority message will sense this and back off and wait. The information is transmitted by two twisted wires that connect all system modules. It is transmitted by voltage difference between the two levels. The high voltage value represents 1 and low 0. Its combination forms an appropriate message. The 4-20 mA Current Loop Board is one of the most robust sensor signaling standard. Current loops are ideal for data transmission because of their inherent insensitivity to electrical noise. In a 4-20 mA current loop, all the signaling current flows through all components; the same current flows even if the wire terminations are less than perfect. All the components in the loop drop voltage due to the signaling current flowing through them. The signaling current is not affected by these voltage drops as long as the power supply voltage is greater than the sum of the voltage drops around the loop at the maximum signaling current of 20 mA. Libelium has added Sigfox wireless connectivity to its portfolio of Waspmote OEM and Plug & Sense! sensor devices and at the same time has make it available for the main Maker platfoms: Arduino and Raspberry Pi. The Libelium Sigfox module has been certified as “Sigfox Ready Class 0” the designation reserved for maximum range devices on Sigfox Low Power Wide Area (LPWA) networks. 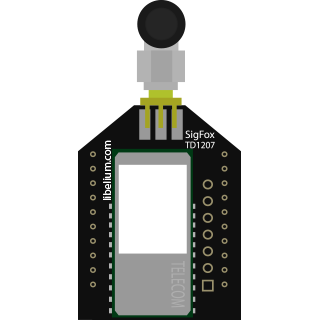 This means we can work with our favorite development platform as “Sigfox Ready” when using it in our projects. Many of the data types are named from its use in driving relays: a single-bit physical output is called a coil, and a single-bit physical input is called a discrete input or a contact. GPS Module for Arduino is a small electronic circuit that allows to connect to your Arduino board to get position and altitude, as well as speed, date and time on UTC (Universal Time Coordinated). Internal GPS antenna is not included. It is sold as an optional and it is required to use the module. The assembled module is Vincotech A1080-B that uses the standard NMEA and SIRF III protocols (www.nmea.org) to transmit the position data via serial port. RFID (Radio Frequency Identification) is a technology that uses electromagnetic fields to identify objects in a contactless way; it is also called proximity identification. There are 2 elements in RFID communications: the RFID module (or reader/writer device) and an RFID card (or tag). The RFID module acts as the master and the card acts as the slave; this means the module queries the card and sends instructions to it. In a normal RFID communication, the RFID module is fixed and the user takes his card near it when he needs to start the interaction. Solar Module for Arduino is a small board that can power your Arduino board, to get a totally autonomous outdoor board. It includes a 3W solar panel that, through the module, provides 5V to your Arduino board, and a 2300 mAh Li-Ion battery. Note:You must charge the battery around 13h. at first time. IR Remote is a small shield that allows you to record any infrared command sent by a remote control and resend it from the Internet. It works connected to Arduino and Raspberry Pi, and let us to control any HVAC system including heating, ventilation, air-conditioning and thermostats from the Cloud. With IR Remote you can easily control our home HVAC system from a laptop, a webserver or even from your smartphone. The shield is compatible with both Arduino UNO and Raspberry Pi so you can choose your favourite platform to automate your home. This tutorial describes some features of Bluetooth module PRO for Arduino / Raspberry Pi which has been mainly designed to discover high amount of bluetooth devices in a variable area. Besides that, connection processes between two bluetooth modules are shown. It has to be mentioned that inquiry processes of bluetooth module are anonymous due to only MAC address is obtained from the bluetooth remote device. No account or phone numbers are obtained. These facts allows saving privacy of bluetooth users. This module fits in the XBee socket of our Communication Shield and allows to connect your Arduino shield to a WiFi network and also fits in the Raspberry Pi to Arduino shields Connection Bridge. Learning Kit is a perfect start for beginners of Arduino world. You can learn basic soldering tricks and practice programming principles when learning this kit. Have prepared a detailed soldering guide and a fully supported library of programming examples from easy to difficult, so electronic could be fun even if you have bare technical knowledge. Hope you have fun and gain some knowledge with this kit! Learning Kit contains some basic electronic resources, like buttons, sensors, buzzer and display. There is a great way to learn how to solder. Learning Kit is a through-hole soldering kit for beginners. After assembling the kit, you’ll have mastered the basics of through-hole soldering. The Robot Kit is an Arduino-controllable tracked robot platform that is less than 10 cm × 10 cm—small enough to qualify for Mini Sumo. It includes two micro metal gearmotors coupled to a pair of silicone tracks, a stainless steel bulldozer-style blade, an array of six infrared reflectance sensors for line following or edge detection, a buzzer for simple sounds and music, a 3-axis accelerometer, magnetometer, and gyro for detecting impacts and tracking orientation. Just sold and assemble it, add 4 AA batteries and an Arduino (or compatible controller) and you are ready to push! Fritzing is an open-source initiative to support designers, artists, researchers and hobbyists to work creatively with interactive electronics. The Cooking Hacks Team is developing libraries of all our arduino modules. Fell free to download and use them with Fritzing when developing your own recipes for the Cooking Hacks community! This tutorial allows the user to turn ON different LEDs depending on the number of devices detected by the Bluetooth module. This tutorial allows the user to measure temperature and amount of light and send it through Bluetooth to an SPP (Serial Port Profile) application. This tutorial allows the user to move a servo via Bluetooth with an SPP (Serial Port Profile) application. This tutorial allows the user to accept or reject an incomming Bluetooth connection with 2 different buttons. This tutorial allows the user to turn on and off a RGB LED with different colors depending on the data sent by the LoRa gateway. This tutorial allows the user to measure the temperature and the light level in a room. This data is sent to a LoRa gateway. This tutorial allows the user to move a servo to different angles depending on the data sent by the LoRa gateway. This tutorial allows the user to make a call to different numbers. Each button can be assigned to a number and originate a voice call. Pushing other button, you can end the voice call. This tutorial allows the user to measure the temperature and the light level in a room. This data is sent each minute to a personal cloud server in Thingspeak, so you will be able to see both graphics in a web page. This tutorial allows the user to send three different emails with color filtered photos. This is achieved by moving three color sheets attached to a servo. This tutorial allows the user to record an audio file, take a photo and store them in a personal FTP logbook. This tutorial allows to use your platform as a caller ID. Each LED can be assigned to a number. When this number calls to the module, the corresponding LED lights on. This project can be developed using the GPRS/GSM Quadband Module (SIM900) with Arduino or Intel Galileo. It is also compatible with Raspberry Pi using the Raspberry Pi to Arduino shields connection bridge. This tutorial allows the user to get temperature and control LEDs status sending text messages with the mobile phone. Depending on the text message received by the module, you will be able to turn ON and OFF two LEDs and get the temperature with a sensor. This tutorial allows the user to translate SMS text messages into morse code. When the module receives a SMS it will reproduce it in morse code through the buzzer. This tutorial allows the user to filter words within an SMS. An LED indicates if the filter has been used or not, and displays the filted SMS in the LCD. This tutorial allows the user to change keys on RFID cards. Also you can read the cards if the key is correct. Each button has a function assigned: enter to change key mode (then you can write your new key with this 3 buttons), save new key and read card. This tutorial allows the user to store the measure taken from the LDR in the RFID cards. When 8 measures has been taken, the RFID module will read them and they will be shown on the LCD. This tutorial allows the user to move the servo (open and close a barrier) if the key of the RFID card is correct. This tutorial allows the user to indentify different cards associated to several people. If they are close to an antenna, RFID card will save how many times that person has been there. This tutorial allows the user to change keys on RFID cards. Also you can read the cards if the key is correct. Each button has a function assigned: enter to change key mode (then you can write your new key with this 4 buttons), save new key and read card. This tutorial allows the user to store the measure taken from the LDR in the RFID cards. When 8 measures has been taken, the RFID module will read them and they will be shown on the Serial monintor. This tutorial allows the user to make a call to different numbers. Each button can be assigned to a number and originate a voice call. Pushing other button, you can end that voice call. This project can be developed using the GPRS+GPS Quadband Module (SIM908) with Arduino or Intel Galileo. It is also compatible with Raspberry Pi using the Raspberry Pi to Arduino shields connection bridge. This tutorial allows the user to measure the temperature of an object. When the temperature is 0ºC or less, a text message is sent to a mobile phone in which the temperature and the position (laltitude and longitude) of the module is indicated. This tutorial allows the user to move a servo sending text messages with the mobile phone. Depending on the number received by the module, the servo is placed in one position or another corresponding to the indicated degrees. This tutorial allows the user to view the GPS position, latitude and longitude, in a LCD display. This tutorial allows the user to set a password key and if it is correct, a LED and a Buzzer will sound printing a message in the LCD. This tutorial allows the user to move a servo to different degrees depending on the data sent by the XBee gateway. This tutorial allows the user to know the sea state thanks to the Waspmote accelerometer and turn ON and OFF several LEDs depending on he sea swell. If there are big waves, all LEDs will turn ON and a buzzerwill sound. Waspmote is an open source wireless sensor platform focused on low consumption modes to allow the sensor nodes ("motes") to be completely autonomous. This tutorial allows the user to know if the bin of your work is full and informs you with the buzzer making a beep. Waspmote uses RTC to take the hour and filter working hours and excluding evening and weekends. This tutorial allows the user to create a file with different measures, temperature, light, date and time and store them in the Waspmote SD. This tutorial allows the user to play a simple melody with a buzzer pushing some buttons and also play a video with Processing software. This tutorial allows the user to know the water leakage and the temperature level thanks to the Waspmote Events sensor kit. Waspmote is an open source wireless sensor platform focused on low consumption modes to allow the sensor nodes ('motes') to be completely autonomous. This tutorial allows the user to know the PIR and light levels thanks to the Waspmote Events sensor kit. This tutorial allows the user to know the atmospheric pressure, temperature and humidity levels thanks to the Waspmote Agriculture sensors kit. This tutorial allows the user to know the soil moisture, temperature and humidity levels thanks to the Waspmote Agriculture sensors kit. This tutorial allows the user to know the light level and the distance from an object thanks to the Waspmote Smart Cities sensor kit. This tutorial allows the user to know the dust and temperature levels thanks to the Waspmote Smart Cities sensor kit. This tutorial allows the user to know the temperature and humidity levels thanks to the Waspmote Smart Metering sensors kit. This tutorial allows the user to know the CO2 and temperature levels in a particular area thanks to the Waspmote Gas sensors kit. This tutorial allows the user to know the CO and humidity levels in a particular area thanks to the Waspmote Gas sensors kit. This tutorial allows the user to know the liquid flow and current levels thanks to the Waspmote Smart Metering sensors kit. Yes, still another 3D Printer... but just give us one minute to show you why this is interesting for a person who starts on the 3D printer world. The price of these printers drops while its performance is improved. This opens a huge world of opportunities. Turn your product designs into reality with 3D printing. Imagine, Print, Go!